“Okay,” I said as I took another deep breath and washed my hands to begin cooking. I half cried and laughed while I began chopping cabbage. He sat back down on the floor, crossed his legs, flicked his hair over his shoulders and began reading out loud. It's important to know that the grieving process for a loved one who takes their own life can be dramatically different from most other types of death. While we understand how heart disease, old age, or car accidents work, the path to suicide happens largely internally. The key is to talk about it and get every emotion: sadness, anger, and others off your chest. He paused and looked up at me and I just gave him a blank stare. He cleared his throat and continued reading. Remember that your loved one did not mean to upset you. They felt they needed to die to get away from themselves or a situation they could not control any more, not you. He looked up again with one eyebrow raised and I still just stared at him. He pulled his fingers through his hair and continued. Remember that it is okay to cry. Someone you loved has died it is natural to grieve them just as you would anyone else. The fact that they committed suicide is just an extra factor to your bereavement. You should try to not think about how they died or time of their suicide at all. Thinking about it will only make you feel worse and the suicide will most likely haunt you in your dreams. Not being able to let go is most unhealthy. Remember to grieve, it's healthy. Breathe, love, and live. The loved one would not like for you to be sad about them not being here anymore. They would want to see you successful and proud of where you have gone and done with your life. He paused, peeked up at me with his eyebrow raised. “What does bereavement and grieve mean?” I asked. He put the book down and began explaining the concept of grieving to me. After he explained it in his own words I realised that I had done the right thing, picking up that book. It confirmed what I was feeling and that my nightmares were normal. As we ate komstborscht and tacos he continued talking about what he read to me and told me that that book was written by a doctor who works with and helps people deal with this kind of stuff. “Okay, thank you for explaining this to me. I understand it much better now,” I said. I realised that in spite of being told all my life that I had severe nerve problems, it was perfectly normal that I was still having a difficult time letting go. Especially whenever I saw or heard a windmill. That sound brought me right back to the night after my grandfather hung himself. I realised that windmills would forever remind me of where I was with those feelings. I turned all red -- I wasn’t used to being complimented on something that was expected of me ever since I could remember. I was not sure how to respond to so many compliments, especially coming from a man. I had never heard a man compliment a woman on her cooking skill in my colony. Most of us girls in the colony were cooking meals, making big batches of dough, and baking on our own by the time we were seven years old. “Absolutely, Anna, you are an amazing cook. I’m serious, I am not bullshitting -- you should be proud of that,” he answered. When we finished eating, as he began to do the dishes, he asked where I would hang my award. I told him that I would like to hang it right above the bookshelf that he gave me for my birthday, but that I didn’t have anything to hang it with. “I hope it stops snowing by tomorrow night,” I said. “I’m sure it will, don’t worry about that right now. After I finish the dishes I will go grab my tool kit and put a nail in the wall where you want to hang your award,” he explained. I lined up all the library books on the shelf while he went home to get his tools. When he finished putting the nail in I sat down on the floor opposite it and stared at it. I took a moment to imagine what it would look like hanging there. George picked up the book and continued reading to me but I just couldn’t keep my eyes open anymore -- I kept falling asleep. When he realised it he got up and told me that I should just go to sleep. He would read the rest of the book to me another time. I slept all the way through until the next morning and didn’t even dream of drifting on the water to Posen Land. My alarm clock radio they said that it had stopped snowing but all the schools were closed that day. That news made me so happy -- I really needed that break. Christina called to tell me that she would pick us up later on, and asked if we would like to go to a club after to celebrate. She told me that a bunch of her friends were going to meet us there. I made myself a nice comfy seat with blankets on the floor and an instant coffee and started reading. I thought about how much I enjoyed reading and that I would never be bored again from that moment on. I decided that I would read every minute of my free time. I read the entire day until I had to get ready for the award ceremony. After I put on dark purple nail polish that I got from Bree I tried on every piece of clothing that I owned. I finally I decided on a white tee-shirt, a black long vest type of thing that reminded me of a schaldüak, and long sporty skirt with white stripes on the sides of it. I put my hair up into a messy bun, put on some lipstick and a necklace that was among the stuff Bree had given me. The necklace looked to me like a tattoo around my neck. 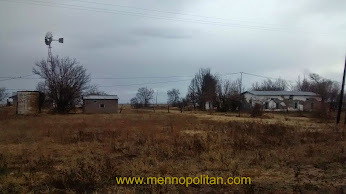 It was important to me that I didn’t look anything like a Mennonite. I wanted to blend in with the crowd, especially if I was going to a club after. I felt nervous, anxious and butterflies all at the same time, sitting on the passenger side while Christina drove. George talked to us the whole way there, sitting in the middle back seat with his elbows resting on either side of the back of our seats. I was shaking with nervousness as we walked into the building. There were a lot more people than I had expected, but then again, I had no idea what to expect. We sat down in the front row. I was so glad that I had invited George because all I had to do was look at him and remember to breathe. When the principal went up to introduce my teacher, my heart started beating out of my chest. Everybody started clapping as my teacher walked up that stage. When she began talking about me my heart skipped a beat. 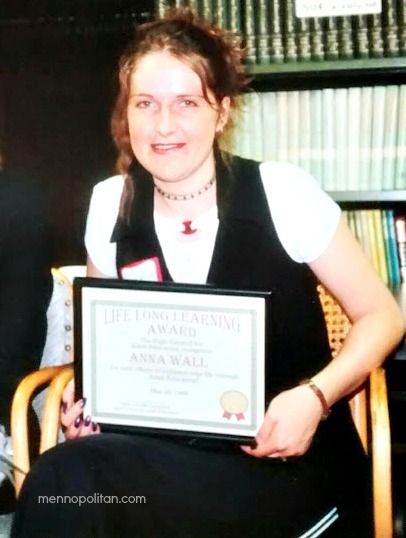 When Anna Wall first came into my classroom, she made an impression on me because she had come to Canada only three years earlier, not knowing any English. She had no schooling other than her grade eight German, yet she was speaking English fluently. Anna was determined to work on her literacy and numeracy skills during the day, rushing off to her full time job after class. In a number of months Anna successfully completed her basic skills and is entering a credit program. Anna’s ability to come to Canada without her family at such a young age and her willingness to immerse herself in the world of learning has demonstrated her courage and dedication despite adversity. She is kind and gentle with fellow students, showing friendliness and warmth while she diligently works. With her usual determination and foresight, Anna speaks of taking more than the necessary courses for her future so school and job choices will be an open road. I feel honoured to present you with this Life Long Learning award, Anna. You are certainly a most worthy candidate! Congratulations! All I heard after that was the loud pounding of my heartbeat. It took everything in me to fight back the tears as I walked up to that stage to receive that award. On the way, walking up to that stage, I remembered the first day I walked to school, how I focused on putting one foot in front of the other, and did the same. My teacher gave me a hug, shook my hand and said, “I am so proud of you, Anna,” as she handed me the paper with her speech written on it and award. I was speechless. I took the award and the paper, held it against my chest, and said, “Thank you,” in a shaky voice. I just couldn’t say anything else. I knew that the tears would start pouring down my face if I did. I worked up the courage to look up at the people as they all began to clap. I just focused on George’s face as it reminded me to breath. I got weak in the knees watching all those people who had been strangers to me just a short time ago and now they were all so proud of me. I didn’t feel worthy of that. “One foot in front of the other,” I thought as I walked back down from that stage. I got hugged by so many people that night. Even teachers I had never met before hugged me and said congratulations. One teacher came over and introduced herself to me and told me that she was looking forward to having me in her grade nine class. I told her that I thought I wouldn’t be ready. She said that she was confident that I would be able to do it. “Oh, okay. Wait, what?” I asked. The way that teacher reassured me that I was ready for grade nine, I realised that I liked her as much as the teacher I had had up to that point and that made all the difference. She gave me the courage I needed to start thinking that I could actually do grade nine. Click here to continue reading my story.